Thursday, February 16th, 3pm IU Cinema. 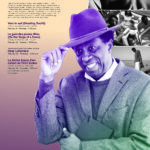 Dany Laferrière in conversation with Thomas Spear, Professor of French at City University of New York. Following the Jorgensen Lecture, the IU Cinema will screen ​La dérive douce d’un enfant de Petit-Goâve (February 16th, 7pm). As part of SustainIU Week 2017, we’re holding a benefit film screening for the UndocuHoosier Alliance on Friday, Feb. 24 at 12pm at La Casa Latino Cultural Center. Please join us for the film “Soil, Struggle, & Justice,” which is about the Brazilian Landless Movement and a cooperative that struggled for land access and then transitioned to agroecology. Food will be provided, and the suggested donation to help the UndocuHoosier Alliance raise funds for an undocumented student scholarship is $5. Please join us and support our undocumented community! You can RSVP on our Facebook page by following this link. Thank you to our co-sponsors: The UndocuHoosier Alliance, the Student Sustainability Council, La Casa, the Dept. 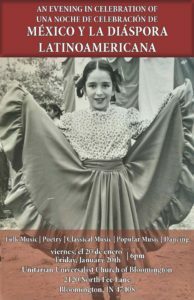 of Spanish and Portuguese, and the Center for Caribbean and Latin American Studies. WIUX Pure Student Radio and the CLACS Graduate Student Association have collaborated to bring Radio Sur, a Latin American and Caribbean music, culture, and news hour to Bloomington airwaves. Tune in to 99.1 FM every Tuesday from 5-6 pm to listen to a mixture of mainstream and underground Latin-Caribbean music as well as the latest news related to the region. Follow Radio Sur on Twitter at @WIUXRadioSur. The producers of the show would like to encourage you to make suggestions and let them know what you thought of the show, or inquire about a possible collaborations (write them at WIUXRadioSur@gmail.com. One World, One Bloomington: An Evening in Celebration of Mexico and the Latin American Diaspora focuses on our diverse, ever united community. This event will feature folk music, poetry readings, classical music, popular music and dancing from the heart of the Latin American tradition, encouraging solidarity and community. An Evening in Celebration of Mexico and the Latin American Diaspora will feature some of the best musicians from Indiana University’s Jacobs School of Music, as well as members of the community at large. Speakers will share their personal stories, highlighting the immigrant experience—each tale as unique as a fingerprint. Come out, and listen, smile, dance, share and celebrate Latino community! This event is free and open to the general public. For more information, contact Alejandra Martinez at am250@indiana.edu.